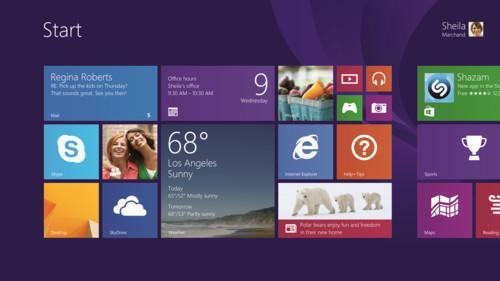 Windows 8.1 is finally here and with it Microsoft's hopes of a second act for its flagship operating system. Windows 8, launched just under a year ago, was a bold attempt to propel the OS into the tablet market but it fell short of that extremely important goal. Apple's iOS and Google's Android are still the dominant tablet OSes, and Windows remains a minor player. The main complaints aimed at Windows 8 are well known by now. The removal of the Start button freaked out millions of users. The radically altered Modern interface, with its touch-optimized live tiles, was considered confusing and unsuitable for mice and keyboards. The toggling between the new interface and the more traditional Windows 7-like desktop felt clunky to many. People were peeved they couldn't boot directly to this traditional desktop interface, which lets Windows 8 run legacy applications. These and other complaints have been addressed in Windows 8.1, which is scheduled to be available Thursday via download from the Windows Store. It will be for sale on Friday in retail outlets as a standalone packaged DVD and in new PCs and tablets. "Windows 8.1 is a significant improvement, more like what Microsoft would have liked to ship a year ago," said Gartner analyst Michael Silver, who gives Microsoft credit for being a lot more open to feedback this time around. Beyond the well-publicized changes in Windows 8.1, there are a good number of other improvements aimed at enterprise IT pros, according to IDC analyst Al Gillen. "CIOs should take a closer look at Windows 8.1 than they did at Windows 8," he said. "Microsoft is clearly responding to the needs of enterprise users." Windows 8 was focused primarily on consumers, but the updated OS boasts more and better IT controls, security features and device management capabilities, he said. "This is a first step to make this a very business-oriented product," Gillen said. "Microsoft got the message that it had to do a lot more work to make the OS more appropriate for business customers." Despite this fact, IDC hasn't changed its recommendation for when enterprises should consider adopting Windows 8.1. Like its predecessor, Windows 8.1 should accompany new tablets, but the upgrade focus for desktops and laptops in most organizations should be on Windows 7, he said. Gartner shares a similar belief. "Organizations still on XP need to press ahead with Windows 7 for the most part. Windows 7 organizations should consider Windows 8.1 for new PC purchases after they make sure everything works," Silver said via email. David Johnson, a Forrester Research analyst, predicts that the appeal of the Modern UI will still be lost on conventional keyboard and mouse hardware. "Windows 7 will be the enterprise IT gold standard on everything but tablets and convertibles for the foreseeable future," Johnson said. Another element for enterprises to consider is that the Windows 8.x OS family seems to be on a much more frequent release cycle, which represents a new challenge for IT departments, according to Silver. "Microsoft will end support for a point release, like Windows 8.1, two years after the next point release ships. If they ship a point release every year, keeping up will be hard," he said. Still, there is a consensus that Windows 8.1 will be helped by the arrival of better hardware, including newer, faster, more battery friendly chips from Intel. "Windows 8.1's potential isn't about what Microsoft has changed or added in," Forrester's Johnson said via email, who views the new and changed features primarily as tweaks. "It's about the new hardware from the OEMs." Silver also sees "the whole industry converging with better products." The processors and hardware in general that were available for Windows 8 were "suboptimal" and contributed to making 2013 a "lost year" for the OS, Silver said. Microsoft is also playing the role of hardware maker with its Surface tablets, which are now in their second generation and are expected to benefit from Windows 8.1's improvements. Windows RT -- the version for ARM-based devices -- fared worse than the regular version of Windows 8 for x86 chips, and it's also getting updated to an 8.1 version. Broadly rejected by buyers and PC makers, the future of Windows RT is very much in question, and Silver isn't optimistic about its prospects. "Microsoft hasn't made the case yet that it can explain RT versus Atom-based systems to buyers," Silver said. "Unless marketing improves, it won't be successful." 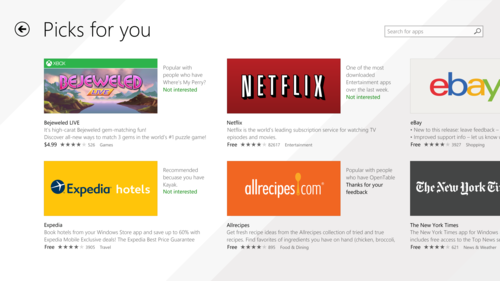 A Windows Store redesign will be unveiled on Thursday and will feature personalised recommendations, automatic updating of installed apps and a new section called "New & Rising" that will display prominently apps that are new and popular.